Two dogs, two cats, two ... ducks? For the last two nights I've had incredibly realistic dreams about not being able to find a bathroom in a large public place (mall, convention hall, casino, etc.). It involved finding lots of tiled rooms with no toilets and screaming at the management. Something tells me I should be drinking less water before bed. Life with Mollie puppy continues to go reasonably well. She goes to "school" on Monday through Friday and I'm taking her on 2 mile bike rides once or twice a day on the weekends. That seems to take the edge off of her but she's still plenty playful and still very much a puppy. I'm happy to have the crate to keep her out of trouble, particularly since the house looks like a bomb went off in it and there are tempting chewy things seemingly everywhere. This evening she got to the styrofoam tombstones from Halloween but those weren't a huge investment, just a lot of styrofoam crumbs all over the living room. 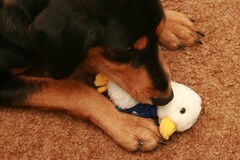 A week or two ago, I bought her a stuffed duck/goose shaped thing that squeaks which Rich started calling Mr. Quackers. Mollie loves Mr. Quackers and carries it around the house like a little doll. Last night while puttering on the computers we heard a cry of help from the hallway. Mollie had found a small stuffed Aflac duck I had brought home and was carrying it around until she prompted his distress calls by squeezing him too tightly. She dropped him and ran out of the room only to return with Mr. Quackers (as backup I presume). Eventually, she reconciled herself to the strange noises Mr. Quackers' Mini Me was making and found a new friend. But it's still disturbing to hear him yelling AFLAC! from the other room.